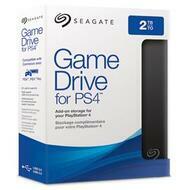 Game Drive for PS4 is a great addition to your gaming toolkit and your winning ways. With 2 TB of storage, the struggle is over. You can easily store 50+ games — that's enough room for the classics and the hottest new releases without having to delete anything. Game Drive’s high-speed USB 3.0 gives you full-speed gaming — just like playing from the internal drive — so there is no need to throttle back.